Was there ever a time when you were on a trip with your kids or your little one and forgot something? Maybe you wished you had brought a specific item and made a note of it for next time, but struggled because you forgot it. I totally know what that feels like… Let me explain, a few years ago when my daughter was a baby, around 1 and a half years old, we went on a trip to see friends and family in Europe. I had packed everything I thought I needed. Diapers, wipes, a few baby picture books and a couple of her favourite toys that were small enough to take with us. But it was a long flight, and with the problems that arose from having a fussy baby, and my lack of preparation, it was a reeeeeeally loooooooong flight. Imagine this, you’re seated on the plane and from the moment the plane takes off, your little one is fussy, cries for most of the plane ride and anything you do (feeding, giving her toys, reading her favourite books), does NOT work. Saying I was tired at the end of that flight would be an understatement. To make matters worse, several of the passengers on the plane made the decision to come up and comment…one lady loudly expressed that she was glad she wouldn’t be on the return flight with us…another couple came up right after and mentioned they understood how tough it could be traveling with a baby and offered their support. Two drastically different reactions…but the whole experience made me realize that I had to figure out a better way to prepare for next time, which helped for following trips. So, I’ve included some suggestions on what I’ve learned in this post so that you can be better prepared, plus I’ve included a checklist you can print and use when preparing for your next trip. Traveling with a newborn can be easier because they require less preparation. Unless they have colic (which can be pretty difficult if you’re flying/traveling), there isn’t too much to worry about, activity-wise that is. Traveling with an older baby on the other hand is a whole different ballgame. You want to make sure you have enough to keep them entertained and happy throughout the flight, but because they can’t yet communicate what they need from you, it isn’t always easy to understand what’s bothering them or why they are fussy. If they are old enough to eat food try offering a snack (have some of their favorites prepared ahead of time) or offer them a drink. If they are not old enough, offer them a feed of breastmilk or formula, depending on the way you’ve been feeding them. Check if you’re not sure. Even if you recently changed it, sometimes you might be surprised. (Also make sure to have enough with you in transit). Is your baby bored or do they want to play? Try entertaining with toys or books you’ve brought. If you can, bring along several new (they could be second hand, but ones they haven’t played with or seen before) and novel compact toys and books so they become interested. Make sure the books are thin paperback picture books so you can lighten your load. You don’t need too many just a few. Is the difference in cabin pressure during takeoff and landing bothering them (hurting their ears)? If your baby is still consuming breastmilk or formula, feed your baby during takeoff and landing as this allows their jaw to move so the pressure doesn’t build up in their ears making it painful and unbearable for them. If they are older you can give them a snack (chewy snacks can help even more like snack bars or gummy bears made from fruit juice). Do you have a backup plan if all else fails and your baby is still crying and fussy? Some travelling parents have figured out creative ways to avoid the wrath of angry passengers who might be fed up with hearing a crying baby…I once read an article about some parents that had created little notecards with a small “gift” bag attached with earplugs for all the passengers with seats in their vicinity…warning them that their little one might get fussy and that they would try their best to calm their baby but in case they needed they could use the ear plugs….I SO wish I had thought of this or had read about this tip as it would of really helped us back then….though I also agree with the argument that you shouldn’t have to apologize for traveling with a little one. So if you don’t have time to make such note cards, don’t sweat it. 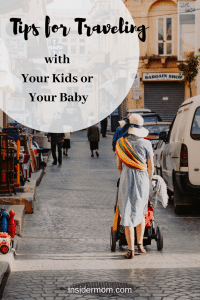 Some things to note, if you’re travelling with a baby or toddler, other than the daily essentials you’re going to want to invest in a good baby carrier/wrap and stroller. They are literally lifesavers! Make sure to test out baby carriers or wraps before you travel as different styles and types work for different parents and babies, for example there was a period of time I could use a wrap and they are easy to fold and pack, but then as my daughter grew she really hated being in it, but loved being in the Ergo baby carrier I had ordered. Some shops offer trial periods and you might be able to find a local group that can help you try a wide variety styles and types before purchasing too. If you’re wondering what stroller to get, check out the Babyzen YoYo+ which literally folds up compact enough to fit in an overhead bin. 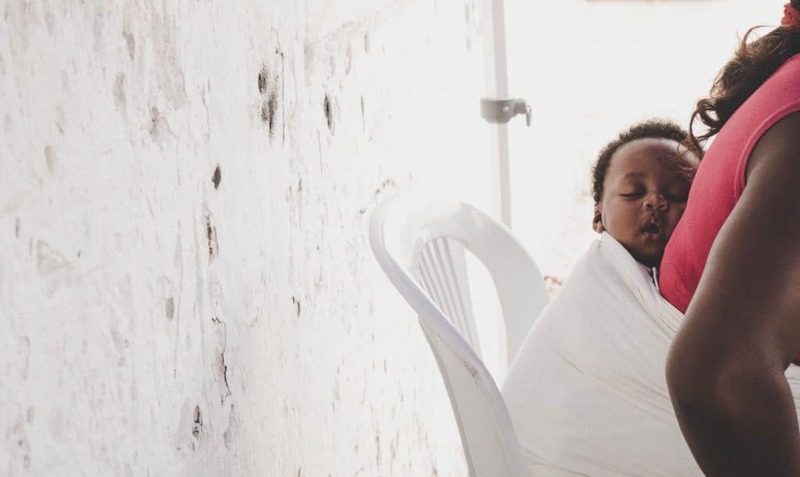 This was recommended by Jess from the Bucketlist Family in her post on Traveling around the world with a growing family. Once your child or kids are little older and no longer babies, things tend to get a lot easier. You still need to think about snacks, drinks, potty breaks and activities, but chances are you won’t have to worry about a long drawn out crying session….for the most part that is. Below I’ve listed some items to consider taking. -Take a tablet or smartphone with Netflix or a kids show app downloaded, that allows you to download episodes for offline viewing. This is great for when your little one is older than 2 years of age. -Download a few episodes of their favorite shows for viewing offline when you put your device in airplane mode. -Get some headphones for your kids or child…you don’t need anything super fancy, but I suggest avoiding earbuds for kids as they are more prone to getting lost with little ones and instead getting them headphones that cover their ears. Even if you forget to download episodes, if your flight has onboard entertainment, they can watch the kids cartoons. -Bring a couple paperback lightweight picture books. -Cards for card games. Little kids can learn to play card games if they are simple, fun and if they’re shown how along the way. If you want to avoid excessive screen time and the crankiness that can sometimes result from it, having other activities to do greatly helps. Whatever your destination may be, I hope this helps you plan for your trip. Travelling with kids can be great, but it’s not always easy, there are difficult times too. Being prepared can save you a lot of stress. Travelling during various stages, when my daughter was a baby, toddler and preschooler where all different and had different things to take into consideration. 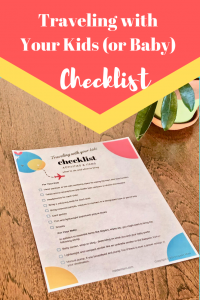 But now when we travel, I make sure to create a checklist of items to take with us and things to do before we head out so I’m better prepared and things go more smoothly. There might sometimes be some hiccups which you aren’t always prepared for and things might not always go as planned, but being ready and packed ahead of time is way better than taking off without prep. Are there any activities or things you suggest taking along while traveling with your kid or children? What’s been a total lifesaver? Please share with others in the comments below…who knows your suggestion might be just what another parent needed.